Anyway, my big launch date is January 3 too, Pepper! I can't wait to show you around my new town. Lots of people who come to the island on vacation think the highlight is going to bars on Duval Street. All I can say about that is a little goes a long way. Though a lot of great bands do come through town--who doesn't want to play Paradise in the dead of winter? The art scene in Key West is amazing, too--my roommate Connie's boyfriend Ray is one of the artists in residence at The Studios of Key West, so definitely check that out. And of course the food...fried grouper, and conch chowder, and Key West pink shrimp. 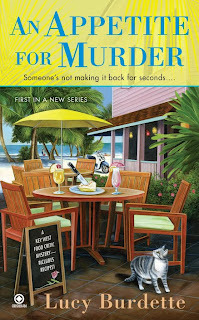 Just be a little careful with the key lime pie...this is a murder mystery after all. And the weather is simply heaven. My mother calls a couple of times a week to complain about New Jersey in November and December. I don't want to say too much about how great it feels down here to be wearing sandals and a sweater when she's moved into boots and a down jacket--she might get the idea of joining me! LOL! And there are all kinds of people in Key West--from filthy rich to homeless, which makes it so interesting. But be a little careful here too about making assumptions about which are the good guys and which are the bad. I'm so looking forward to seeing you all next month! You can follow my writer Lucy on Twitter (she tries not to talk only about me!) or facebook or on our website. She's posted a sample of the new book there, and all kinds of recipes too, including our favorite Christmas cookies! Down jackets and boots can be pretty comfy. I keep telling myself that. Key West is one of my favorite spots-- although I've never been there. I'm so looking forward to the armchair travel in January. Nothing like reading about warm climes when you're buried in fleece in front of a fireplace. Looking forward to hearing about the happenings in Key West. Brrrr... snow on the ground today, and I have to hear about living in paradise?? Not fair! My sole visit to Key West was a comedy of errors. Nothing went right all day long. We still laugh about it! But right now as I hear cold rain falling and the skies are bleary and gray, Key West is sounding pretty good!